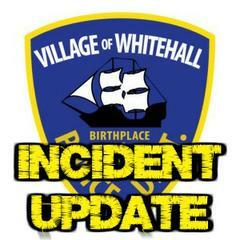 INCIDENT UPDATE (Montcalm Avenue): Ongoing law enforcement operations on Montcalm Avenue completed at approximately 11:59 PM. Ongoing law enforcement operations on Montcalm Avenue completed at approximately 11:59 PM following a barricaded subject being taken into custody at a Montcalm Avenue residence. The subject was taken into custody with assistance from the New York State Police and Washington County Sheriff's Office (NY) and is currently being evaluated / treated at a local hospital. The subjects injuries are non-life threatening and additional charges are pending. A full press release will be issued later today. The members of the Whitehall Police Department (NY) want to extend our thanks to the New York State Police, NYSP SORT Team, Washington County Sheriff's Office (NY) and the NYS Department of Environmental Conservation Police for their assistance in bringing the incident to a safe resolution. We also thank the members of the community for their support and understanding during this incident.